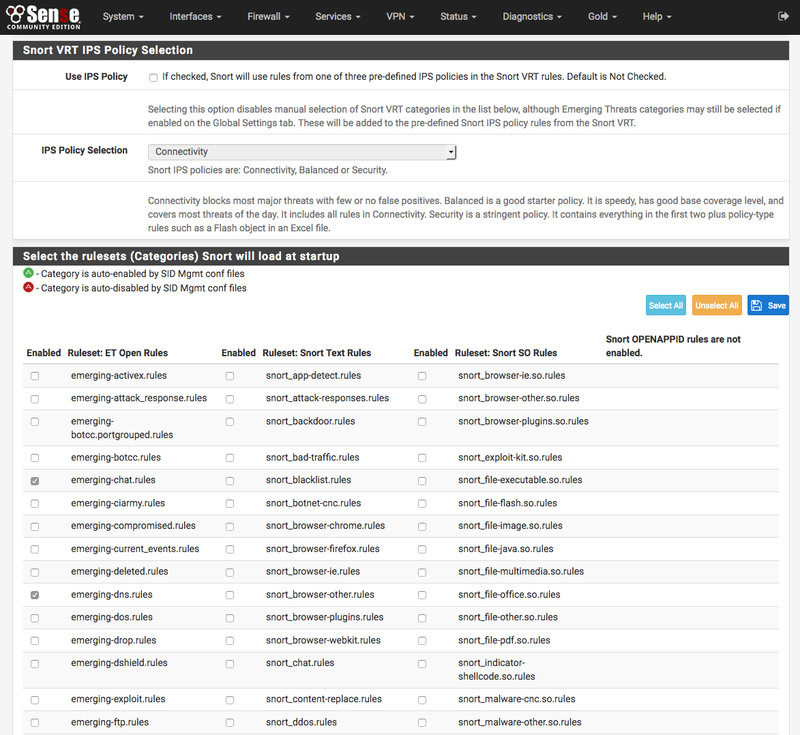 If a Snort VRT Oinkmaster code has been obtained (either free registered user or the paid subscription), and the Snort VRT rules have been enabled, and the Oinkmaster code has been entered on the Global Settings tab then the option of choosing from among three pre-configured IPS policies is available. These greatly simplify the process of choosing enforcing rules for Snort to use when inspecting traffic. 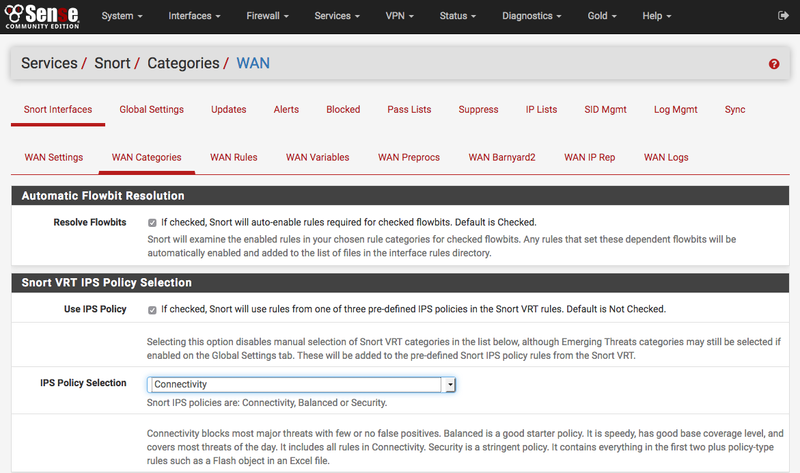 The IPS policies are only available when the Snort VRT rules are enabled. The three Snort VRT IPS Policies are: (1) Connectivity, (2) Balanced and (3) Security. These are listed in order of increasing security. However, resist the temptation to immediately jump to the most secure “Security” policy if new to using Snort. False positives can frequently occur with the more secure policies, and careful tuning by an experienced administrator may be required. So if new to Snort, then using the less restrictive “Connectivity” policy in non-blocking mode is recommended as a starting point. Once experience with Snort has been gained in the network environment, blocking mode can be enabled and then move up to more restrictive IPS policies. If the Snort VRT rules are not enabled, or to use any of the other rule packages, then make the rule category selections by checking the checkboxes beside the rule categories to use. Be sure to click SAVE when finished to save the selection and build the rules file for Snort to use.